My October page took its own long, slow time to unfold. A candle image started teasing into my imagination during a meditation several months ago. I meditated some more on this candle image and it grew into thoughts on illumination and wisdom. 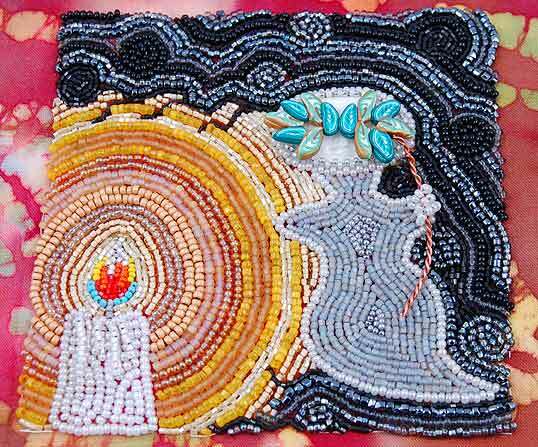 I originally wrote about the candle illuminating and unmasking my Higher Self but this changed as I beaded the page. November was a busy month with preparations for my jewelry show and then Thanksgiving not even a week later. So, finding time to bead was a challenge. When I actually sat down to bead, my mind was crammed full with all of the things on my “to-do” list. An inner voice kept droning on and on that I should be doing this and I should be doing that. My gremlin voice. Hmmmm… As I let my mind settle around all of these thoughts, I began to imagine my illuminated candle, not the figure, as my Higher Self. The figure represents my gremlin. Though she looks serene, almost like she is sleeping or meditating, she is always there, a ghostlike figure, watching, waiting for the perfect moment to find my cracks. She feeds on what lies in the cracks of my psyche, my guilt about not being “good enough”, a good enough artist, a good enough mother, a good enough friend, a good enough partner, a good enough person. She tells me about all of the things I should be doing and, if I don’t do them, I am a failure. I cannot get rid of this gremlin because she is a part of my psyche, my inner critic. Instead, I let the light of my Higher Self, who I truly am, illuminate her and unmask her for what she is. And then I embrace her as a part of me. This page was a struggle for me but it also brought me deeper into myself while I was beading it. My gremlin voice tells me that I am behind with my beading. My Higher Self tells me that I am not too far behind and it will all come together in its time. And now I turn my attention to starting my November page which marks the halfway point on this wondrous journey. This entry was posted in Beaded Journal Project, Beads, Inspiration, Journaling, Polymer Clay and tagged bead embroidery, beading around a cabochon, polymer clay cane. Hello dear – glad to see that you finished your page! I like the color contrast and the candle theme. Joseph Campbell often talked about the divine that is in each one of us and in everything around us. He mentions that people in some cultures welcome others into their home as visiting deities since they carry the divine within. He also speaks of our minds/bodies/consciousness as being a kind light bulb for the divine light to shine through. I like to think that we are candles that slowly burn away and release the divine light. Your candle reminded me of the divine light that we all carry. Joseph Campbell was a very wise man who is still illuminating lives long after he has passed on. I’m glad that my journal page inspired such wonderful musings. Thanks for sharing, my dear. What I loved, as I looked at this, was how close the light was to “enfolding” the gremlin. Sometimes I think our gremlins need to be loved into transforming. The first thing is acceptance. Hearing the voice of the gremlin, knowing that you don’t need to dance to that tune, and then loving the insecurities that cause it to bring darkness instead of light. I loved this piece and your thoughts about it. It was very moving. Thank you. I love this page, I especially enjoy the bottom image with the leaves over her face as if – for a short time she can’t see into those cracks. This is such a beautiful page. Thanks so much for sharing it and your thoughts about it. Thanks Barb and Grace, for sharing your thoughts about my page. I loved your comments about loving and accepting our gremlins, Barb. So true, so true. Grace, you have given me another way of looking at this. Once we have “unmasked” our gremlin and embraced that side of ourselves, we can then symbolically place a mask on them of our own choosing. The “mask” transforms the gremlin and what they “see” and, more importantly, how they influence us. aaaahhh…. 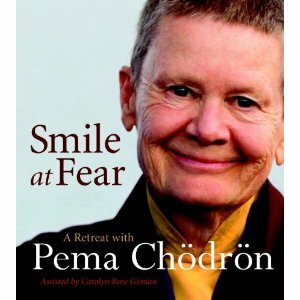 When I look at your page, I see the glow from the candle growing to engulf that gremlin. We all have our insecurities and in some ways that is healthy, but if we let that gremlin win, we lose part of ourselves. This is a beautiful page and it gives me a really good feeling. Thanks Acey, for sharing your comments. I’m glad you enjoyed reading about my page! Thanks Arline. Yes, it is healthy to accept all the different sides of ourselves, light and dark. I’m glad my page gave you a good feeling! Your explanation of your gremlin hit some chord in me…… it very much feels like what my depression does to me, watching and waiting for just the tiniest crack….then slipping in. thanks for sharing. karen, your work, and your words, are both beautiful. i am no beader – i do use the tiny seed beads in the simplest form in my work, and i know how much eyesight and concentration is involved just to thread them onto the wire. that you have designed such a beautiful “tapestry” is incredible. i see you, actually, as the candle. full of light. sharing wisdom with everyone who comes here. no, we don’t see the gremlin – only you can (and boy, do i know that feeling) – and the light does overshadow, ultimately, that little goblin in the dark. Hi Pam, You’re quite welcome. Yes, I can see how if we give in to our gremlins and let them have their way, we can become depressed. There is a book called “Taming Your Gremlins” that you might like to take a look at. It helped me a lot. again…the story behind the work is so inspiring, it’s hard to decide which part of this journey I like the best….the beading or the stories? Thanks Bobbi, I’m glad it inspired you. I know what you mean. 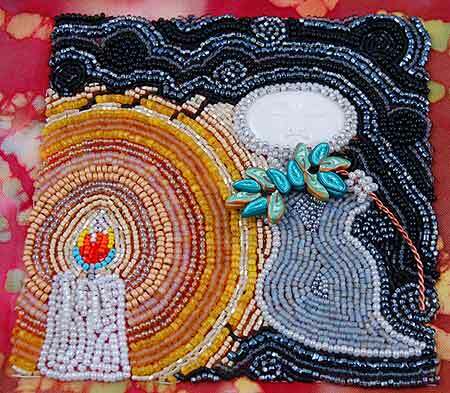 The beading I’ve seen with this group is so gorgeous and the stories have an equally powerful impact on my psyche. What can I say that has not already been said? This is a wonderful composition (I love the mask, especially) and your insight regarding this page gave all of us a glimpse into your creative soul. The candle glow looks mighty powerful to me. That gremlin looks like she has her work cut out to conquer that light! Timaree, thanks for your comments. Yes, I am working on shining my light on those gremlins everyday! These are some thoughts that I had after meditating on your page and reading your and others post. You may think they don’t really relate…but we can all look at the “same” rainbow and see a different one. Consider that when you read what I saw and thought about. Amazing how working on a piece of art over time develops into metaphors for what we are going through. Mirrors of our soul. I think when we revisit our pages in the future and think over the times that we are living in, we may see even more meaning that we were blind to because of the moment. Your candle stands out to me as source of hope. I love thinking about “The Light” as being The Truth (and I mean all truth) both my truth and others truth and Divine Truth. The Truth illumines my gremlin. The Truth guards me against the gremlins nay sayings, but also shows me the way for growth and change. I think that my gremlin has to wear protectors on her eyes when she approaches the light. To me the Light is my only safe guard against the gremlin. Recently I have been meditating on the snake and how he sheds his skin (or his perceptions about ourself or others) as he grows. As our gremlins challenge our oppinion of ourself and others we work against that even as a snake works against the ground to shed his skin. I have been listening to the book The Lord of the Flies by William Golding and read by the author. At the end of the story he tells us one of the meanings of the story, but concludes by saying that the real meaning of the story is the one that you give to it. So I loved spending a little time in my day to meditate on your page …thank you, it is very beautiful and powerful. Wow, thank you so much for taking the time to meditate on my page and share your thoughts. I enjoyed reading your comments and point of view.